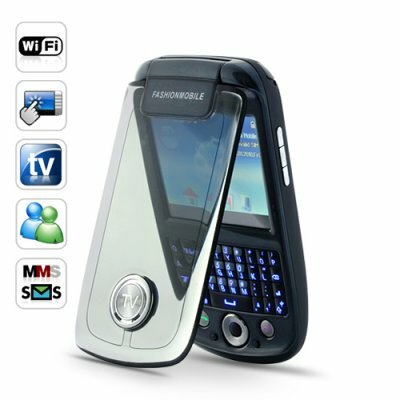 Successfully Added Transforma - Touchscreen WIFI Dual-SIM Cell Phone with QWERTY Keyboard to your Shopping Cart. Introducing Transforma - Touchscreen WIFI Dual-SIM Cell Phone with QWERTY Keyboard, a practical and versatile phone for both personal and business use. With its clean and streamlined form factor, this cell phone is extremely suitable for business men and women. It’s a perfect balance between function and beauty. Just hold the phone in your hand and feel the responsive and smooth keys. Even if you spend hours texting, writing emails, or browsing webpages, your fingers will still feel relaxed. With two SIM cards and phone memory, you can store up to 1000 contacts. Your clients or business partners contact information will be well protected however many there are. The Dual SIM card feature will allow you to separate your business calls from your personal calls, so you can maintain a balance between work and life. Additionally, it will be especially useful if you travel cross-borders frequently, as you can use one SIM card to place and receive phone calls locally, and the other to receive infrequent phone calls from your own country, and save yourself a lot of money. The Transforma is a versatile entertainer. Whether you are in the mood for gaming, surfing the internet, or capturing a memorable moment with a camera or camcorder, she'll meet your every need. What’s more, its analog TV function gives you access to endless hours of high definition entertainment. Perfect for both personal and business use, the Transforma is now available at an amazing wholesale price. Buy a sample today and we will express ship it out tomorrow. Add it to your online store product line and make great profits. Brought to you by your source of China factory direct electronics – Chinavasion.